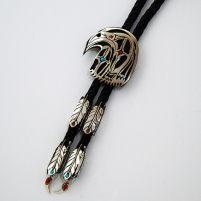 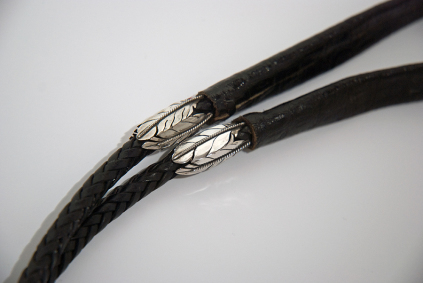 Above and left: details of black leather flat-back bolo cord decorated with sterling silver eagle feathers. 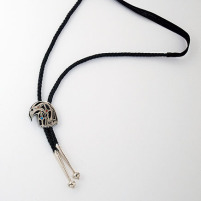 The bolo cord has a flat, wide section where it goes around the back of the wearer's neck for increased comfort and a better fit under a shirt collar. 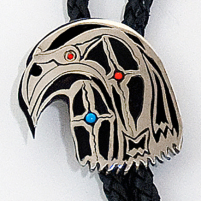 Right: Close-up of the hawk head bolo slide set with turquoise and red coral cabochons. Bottom right: bangle tips of stylized nails of eagle and hawk talons set with pear-shaped red corals.